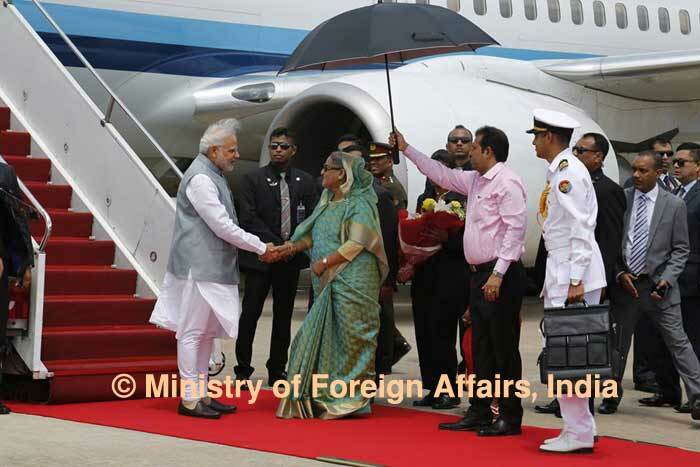 Dhaka, Bangladesh (BBN)-Indian Prime Minister Narendra Modi thanked his Bangladesh counterpart Sheikh Hasina for according him cordial reception at the airport on his arrival Saturday morning. “Thank you PM Sheikh Hasina for the warm welcome,” he wrote on his Facebook post immediately after the Bangladesh PM received him at Hazrat Shahjalal International Airport in Dhaka, the capital of Bangladesh. Earlier, a special aircraft carrying the Indian PM touched the ground at Hazrat Shahjalal International Airport in Dhaka, the capital of Bangladesh, at 10:10am on Saturday. Bangladesh provided him grand welcome rolling out a red carpet amid expectations on both sides to take bilateral ties to a new level and unleash the potential of economic and trade ties.